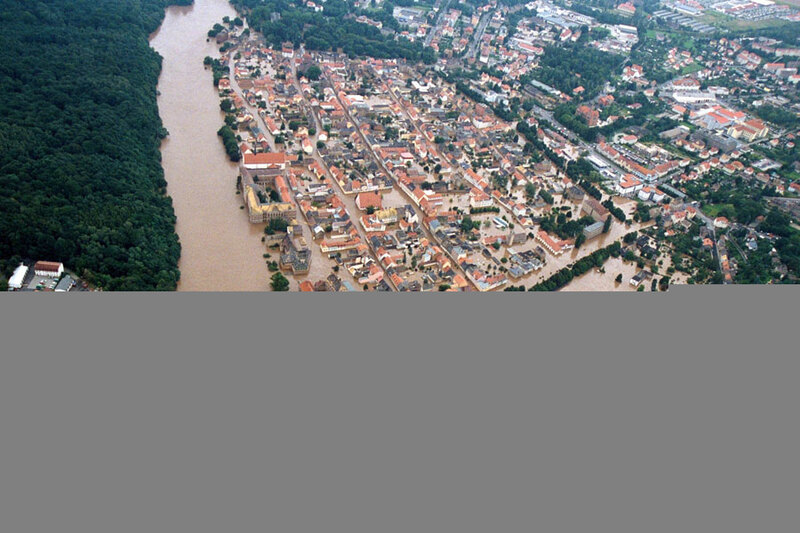 Elbe flooding Grimma in Germany in 2002. 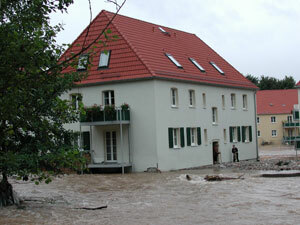 Weisseritz flooding in Germany in 2002. 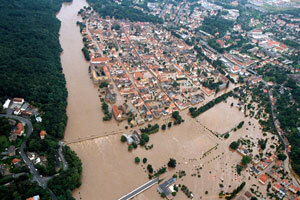 Recent floods in Europe are the Rhine and Meuse floods of 1993 and 1995, the Oder flood of 1997, the large floods in northern Italy of 1994 and 2000, the Elbe flood of 2002 and the UK floods of 2000 and 2007. The larger rivers get their water from a large area and flow through many countries. The area a river derives its water from is called a catchment area . Especially the Rhine, Meuse, Oder and Elbe river floods showed that floods are not only a problem of individual countries, but have a strong cross-boundary character. Ironically a flood up stream reduces the chance of flooding down stream, because the river will be carrying less water down stream. All sorts of water control actions taken in one country will influence what happens in other countries in the same catchment. This is so during a flood, but also in preparing for floods. If you reduce flood risk in one country in the catchment, by taking measures like heightening dikes, you may be making flood risk higher in another country in the catchment. The recent flood disasters in Europe were all caused by rain fall and rivers flowing over or breaching through their banks. Storm surges which caused the flooding of large coastal areas date back to 1953 (mostly the southwest of the Netherlands and eastern England) and 1960 (northern Germany). Since then, improved flood defences along the coast and huge storm surge barriers in various estuaries have reduced the probability of such events. The virtual tour shows several examples of floods.